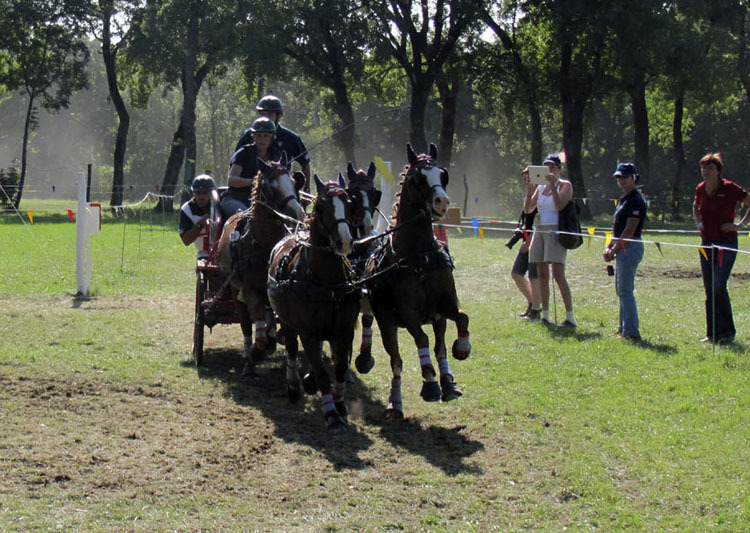 Karen & Pat Garrett sent this report and photos from today’s marathon phase of the World Pony Driving Championships. Also, just to clarify, I’ve been giving credit to both Karen & Pat, but I believe Pat’s been writing the reports and Karen’t been taking the photos. Just so you know. First, the numbers and then at least a bit of the story. While the U.S. singles and pair drivers were not in the top ten for marathon, their consistency between dressage and marathon has left several of them well-placed to have a shot at medal positions. Individual driver Suzy Stafford was fastest of the U.S. single-pony drivers with total penalty points of 73.28, which put her in thirteenth place in the marathon and, except for a problem entering F at the first obstacle, she had a smooth, impressive round. But for that small bobble, she would have been in the top ten on the marathon. In any case, she stands in an impressive fourth place overall after the dressage and marathon phases, with a score of 118.34, or fewer than two balls behind the leader, Germany’s Dennis Schneiders (114.73). Team driver Randy Cadwell had 76.36 penalty points, which put her in eighteenth place in the marathon and, again, but for one issue in obstacle 3, she would have been significantly higher in the standings. Overall, after dressage and marathon, she is in ninth place in the single-pony division, with a score of 124.49, putting her just over three balls from first place. Shelly Temple had a smooth round that gave her a 79.39 in the marathon (twenty-third place) and an overall combined 124.06, for eighth place and, again, just over three balls out. Having seen Jennifer Matheson’s beautiful drive it is difficult to believe that she was thirteenth among the pony pairs in the marathon, with a 76.72, compared to the 70.66 of the pairs winner, Ewoud Boom of the Netherlands. Jennifer’s consistency in the two phases is shown by the fact that she is in sixth place overall with a combined dressage and marathon score of 122.8, fewer than three balls behind leader Dieter Baackmann, who has 114.16 points. Wendy O’Brien, competing in her first championship, had 93.61 in the marathon and 155.43 overall. 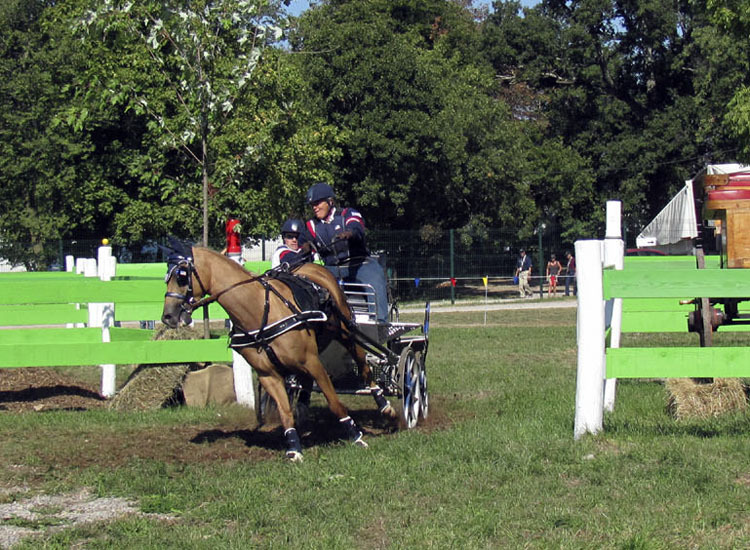 Wendy was one of numerous drivers who had a problem in obstacle 6 going from gate F to the exit. There was a tight, slightly off-center path going up a steep slope, and the risk of hitting a post on the left or a tree on the right. 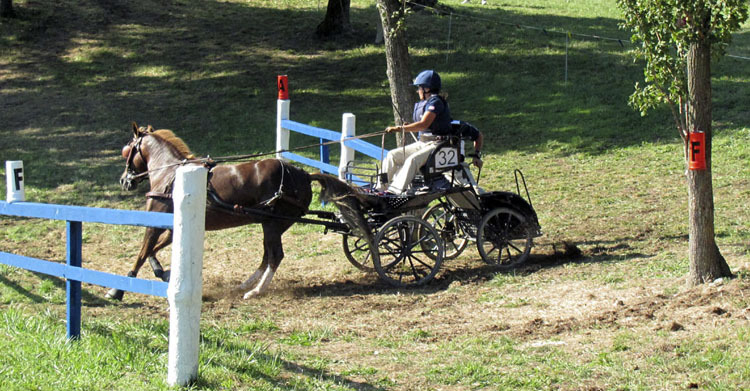 Wendy hit the post and nearly came out of the seat; however, she and her groom pulled off the post and all was well. 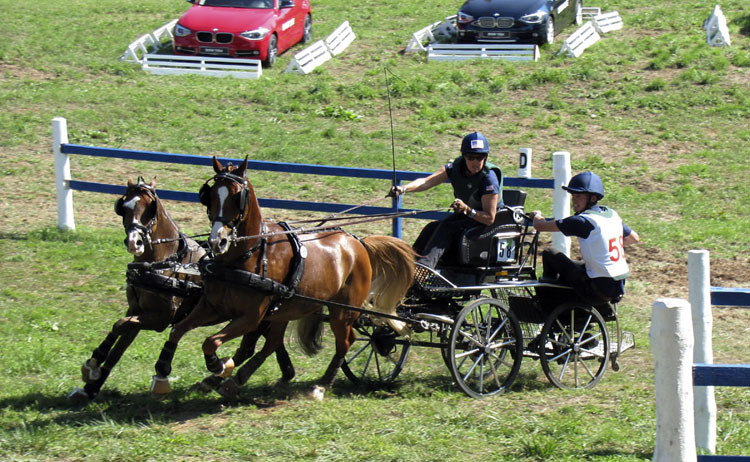 Both U.S. four-in-hand drivers, Laurie Astegiano and Lisa Stroud, had confident, smooth marathon rounds. 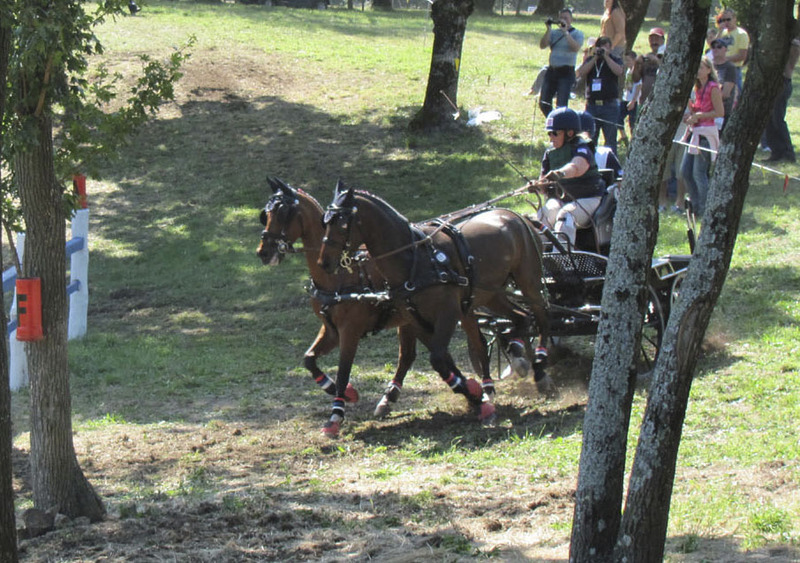 Laurie had 91.96 points and Lisa Stroud had 87.05, putting them in eighth and fifth places respectively in the marathon, compared to the 73.4 for Dutch driver Bram Chardon, son of the well-known four-in-hand driver Ysbrand Chardon. Overall, Lisa has 138.25 (sixth place) and Laurie has 148.66 (eighth place), compared to the 117.43 of the leader. Overall, the United States has held its third-place position in the nations’ competition, behind Germany and the Netherlands. With the elimination of Dutch driver Yvonne De Ruyter, which cost the Netherlands her dressage score of 44.03 and substituted the 52.74 of Melanie Becker, there was some hope the U.S. would move up; however, with strong scores by Dutch pairs driver Ewoud Boom and four-in-hand driver Bram Chardon, this was not to be the case. After the marathon the U.S. has 382.08 points, compared to 360.39 for the Netherlands and 345.01 for Germany. The U.S. remains 38.61 points ahead of fourth-place Great Britain. There are many stories that will be related over time. However, the most interesting of a long day was near the end. 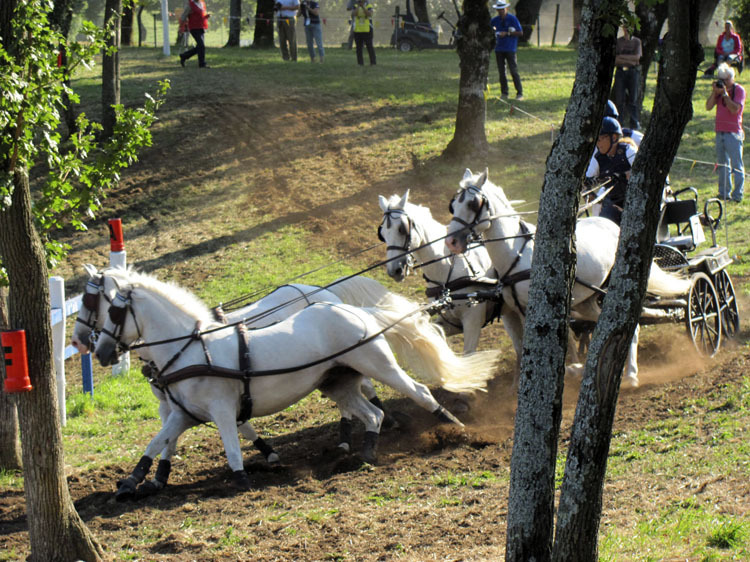 Lisa Stroud had completed obstacle 2 and was out on course when Aart Van De Kamp, an individual driver from the Netherlands driving a Shetland pony team, had a wreck in obstacle 3. One of the leaders tripped and the wheelers ran up over the leaders, creating a huge pile-up of ponies. 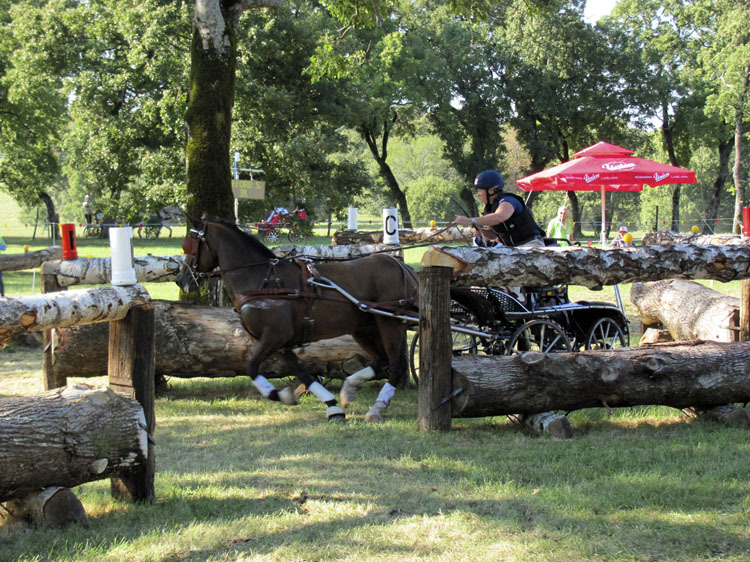 As they were being disentangled (successfully, with no harm to the ponies) another drama was unfolding in the fourth obstacle as Josef Dobrovitz of Hungary missed his turn into E but hit the post in E and took out the fence of which it was a part. He went on through F and was, of course, eliminated. However, this required a rebuild of a portion of the obstacle. 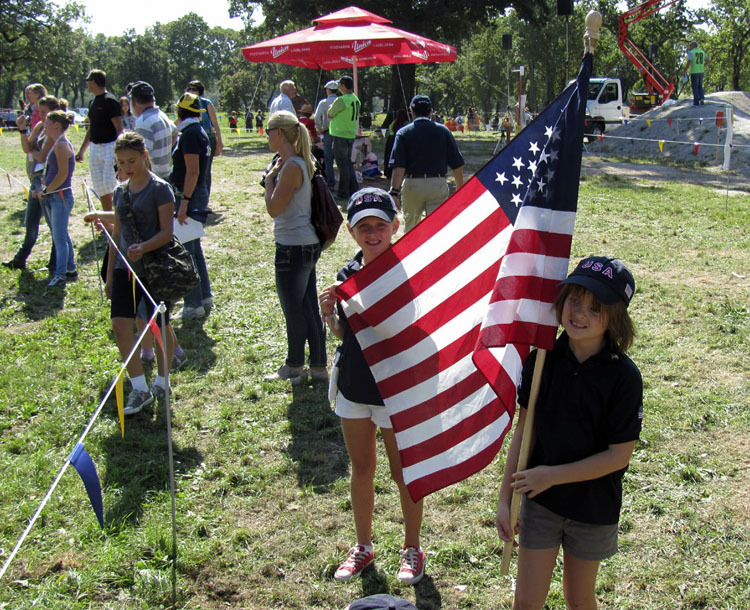 In the end, the entire marathon course was put on hold while the issues in obstacles 3 and 4 were resolved. The results were delayed as a result of an interesting question as to whether a Dutch driver should be eliminated. The result was no elimination, but we do not have completely clear information about what is a very unique question. We will relay this tomorrow.